BIG BEAR LAKE, Calif. -- The sound is hard to describe, but it's sweet music to trout fishermen, especially those who fish Southern California's Big Bear Lake with John Cantrell. The owner of Cantrell Guide Service calls the noise from lead core line zipping out of a reel "music to my ears." It signals that a fat rainbow trout is on the other end. On a recent outing, the melody was heard often, and customers learned of its joys and how to properly respond. "We always tell people fishing for rainbow trout not to start reeling like they have a 2 by 4 on the other end of the line," master guide Cliff Fowler told the anglers with the San Bernardino mountains shooting toward the sky behind him. "It's about finesse. Reel gently, and most importantly, don't stop reeling, even if it feels like you lost the fish." The formula has perfect pitch aboard Cantrell Guide Services' 24-foot pontoon. While demonstrating, Cantrell accidentally hooks a fish then promptly shakes it off. "We let the customers do the fishing - we just instruct," he said. The two also offer comedic advice, from jokes to a light-hearted attitude that filled the windy silence as we wait for a bite. 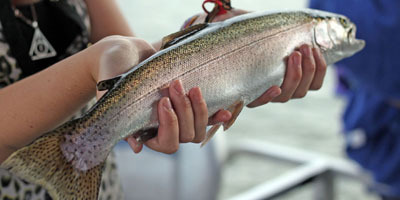 The peak season for rainbow trout, Fowler said, is April and May, when the water temperatures are around 50 to 55 degrees. Today, in early July and 7,000 feet above sea level, Big Bear Lake steams at 72 degrees. "This is extremely warm temperature for the trout," Fowler said. "It'd be like us trying to run a marathon in 120-degree heat." Fowler, who runs the local fishing report for the KBHR 93.3, knows everything from what temperature the trout get feisty in, to the thermocline of the lake and its importance in the trout fishing equation. He explained that the thermocline is the thin layer of water between the warmer surface water layer and the cool deep-water layer. It's where the rainbow trout thrive. The thermocline changes with the water temperature, and the key to catching a hefty number of rainbows is how anglers get the bait into that specific area. "If you troll, you'll outfish those using drop baits 4 to 1," Fowler said. As the Cantrell crew begins to troll, using nightcrawlers for bait, other boats around are sitting inactive in their drop-bait approach. Cantrell's setup seems flawless. On the back of the pontoon lay four reels. Two sit straight out, with two on the sides. Trolling and joking, the symphony begins. Cantrell claps twice and yells "come on fish!" A reel zips, as Fowler yells, "Who wants it?" One of the seven passengers on board steps up and grabs the pole. "Remember, keep the tip up to keep the pressure on the fish," Fowler advises. The fish is slowly reeled in, and once close enough, Fowler swoops it out of the water with a net and into a holding tank. Minutes roll by, and Cantrell claps twice and yells "come on fish!" Another reel zips, and another song is sung. "I guess I'm old school, and I don't change," Cantrell said at the dock. Some rainbows had been released, and another filleted for its rich, pink meat. While some might tell Cantrell that other methods, such as using a downrigger, may be more effective, he doesn't buy in. His numbers - catching more than 2,000 rainbow trout last season - don't lie. Since 1991, he's been studying Big Bear Lake. At one point, he was even the only fishing guide. With three trips per day, he and Fowler are constantly on the water, showing children how to catch their first fish and teaching experienced fishermen how to avoid instinct and reel slowly, trusting their process. Deep in the mountains, hours away from any suburbs, the two hear their favorite song every day -- the sound of lead core line zipping. And that's what keeps them coming back day after day to work - to hear nature's music funnel into their ears.